Originally titled Pearl, The Rose (1979) was initially conceived as a biopic about singer Janis Joplin (Pearl was the name of her last album). However, when her family refused the rights to her story, the producers fictionalized Joplin’s life enough to avoid litigation but it is hard not to see Bette Midler’s eponymous protagonist as a thinly-veiled take on the tragic singer. Regardless, Midler delivers an absolutely searing performance, transcending the sometimes cliché-ridden material. 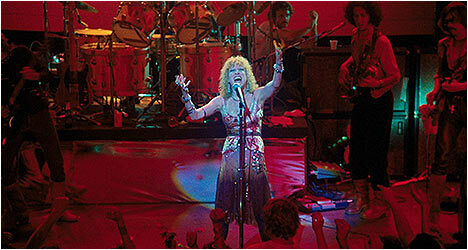 Rose (Midler) is in the midst of her 1969 tour, barely keeping it together as she and her band fly from city to city. Getting off the plane she’s a mess, stumbling down the stairs and absently dropping a bottle of liquor on the tarmac. On stage is where she comes to life, giving it all for her fans but it’s getting to be too much for her and she pleads to her manager (Bates) for some time off. He doesn’t want to hear it as cancelling the rest of the tour would mean losses in millions of dollars of potential earnings. Naturally, she continues on with the tour but signs of her increasing burn-out become more frequent and The Rose plays out her inevitable self-destructive downward spiral. The Rose was Midler’s first starring role and she gives everything she’s got, especially during the concert sequences, which allow her natural singing and performing skills to shine. She also does a fine job off-stage, portraying an increasingly fragile artist burning the candles at both ends. Ever the charismatic presence, Midler is riveting to watch even when it is obvious how the film will end and what will happen to her character. Alan Bates is also excellent as Rose’s controlling manager. He doesn’t care about her well-being so long as she can make it to each and every gig and finish a set. To him Rose is simply a commodity that he uses to get rich and the actor nails the manipulative aspects of his sycophantic character with uncanny authenticity. Not surprisingly, the best parts of The Rose are the absolutely electrifying concert scenes where Midler belts out gutsy renditions of classic R&B songs. She uses her real-life performing skills to maximum effect during these sequences, putting it all out there in a way that is mesmerizing to watch. Ultimately, The Rose is about a self-destructive singer surrounded by enablers for her worst habits. She’s drowning in her own excesses, looking for help and finding little because no one wants to stop the gravy train. It’s a story that has been told before many times but so long as it continues to play out in real life, with the likes of performers like Amy Winehouse dying way too young, this cautionary tale bears being retold. The Criterion Collection Blu-Ray transfer has a wonderfully textured quality that preserves its filmic look while showcasing its vibrant colors, especially during the concert scenes. There is an audio commentary by director Mark Rydell that was recorded in 2003. He covers a variety of topics including casting of not just the actors but the band that backs Midler’s character throughout the film. The director talks about the changes made to the screenplay when it no longer was about Joplin and recalls the logistics of shooting the concert sequences. There is a wonderfully candid interview with Bette Midler who doesn’t shy away from voicing her opinions about the shortcomings of early drafts of the script or how she didn’t care for Paul Rothschild’s rehearsal methods. She also recalls working with Rydell and the cast, including her backing band. Rydell is also interviewed and discusses how he got involved in the project as well as getting Midler on board while also dealing with her difficult manager. Some of the material covered on his commentary track is repeated, including the challenges of shooting the concert scenes in front of 6,000 people. Cinematographers John Bailey and Vilmos Zsigmond, the latter of which worked on The Rose, talks about Midler’s performance as well as delving into technical aspects, like the lighting that was used, the color scheme that was adopted and the composition of specific scenes. There is an excerpt from NBC’s Today show that featured Tom Brokaw interviewing Midler and Rydell during filming. Finally, there is a 1979 interview with Midler by film critic Gene Shalit. She talks about her character and is her usual charming self.